GreenPak Cooperative Society is closely monitoring the current policy changes being effected by Government as GreenPak Cooperative Board wants to be actively involved in the adaptation of the Waste Electrical & Electronic Equipment (WEEE) system in Malta. In this regard, GreenPak is currently in discussion with Government on how to best implement the WEEE system so as to ensure a level playing field, and that the high compliance targets are met within the least possible timeframe. This was stated by GreenPak’s CEO, Ing Mario Schembri, during its tenth Annual General Meeting (AGM) in the presence of the Minister for Sustainable Development, the Environment and Climate Change Leo Brincat. GreenPak Coop, a MEPA authorised scheme, operates across Malta and Gozo and manages the collection of packaging waste and organises its recycling. The cooperative receives its funds from companies whose trade contributes towards the generation of packaging waste. Any remaining surplus in funds is at the end of each year given back as ‘Patronage Refund’ to the very companies that finance the operations of GreenPak and are members of the society. Following its AGM, GreenPak is set to distribute a record 26% of the annual participation fees paid by its cooperative society members. The surplus fund, which was generated by its recycling activities during 2014, will be distributed proportionally between its members according to the amount of money paid by the respective company into the cooperative. The AGM was also addressed by the Managing Director of the Extended Producer Responsibility Alliance (EXPRA), Joachim Quoden. 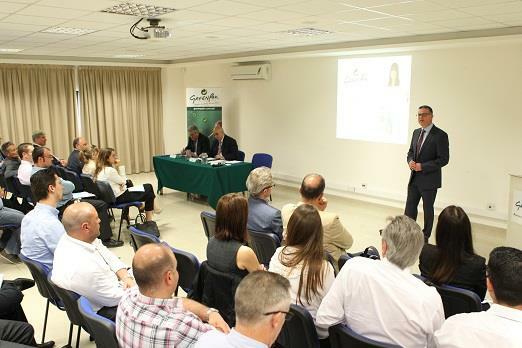 As a founding member of EXPRA, a not-for-profit international organisation promoting the concept that it is private industry itself that should take up recycling, GreenPak is on the forefront advocating the concept of Extended Producer Responsibility (EPR) within the Maltese business community as the way forward to a Circular Economy. Mr Quoden focussed specifically on the implications of the EU proposed Circular Economy package on Malta. “Moving towards a more Circular Economy requires commitment but also a collaborative approach involving the local authorities, businesses and the local community. GreenPak is set to help facilitate a cultural shift that will lead to improved designs reducing waste of products and the creation of new consumption patterns,” he said. GreenPak is the largest waste recovery scheme in Malta, with over 1,300 companies actively contributing, while 41 Local Councils have entrusted GreenPak with the waste management of their locality. During the AGM, the 2015 Business Plan was approved. The new cooperative board of committee members consists of Mr Martin Borg, Mr Dennis Zammit Cutajar, Mr Edward von Brockdorff, Mr Louis Cardona, Mr Pierre Fava, and Mr Victor Galea.